Looking for a more private personal training experience? Next Level Fitness Studio provides an intimate one-on-one private training experience in an upscale studio setting with brand new equipment and technology. Learn more about our private personal training here. 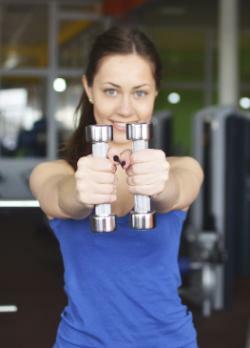 Whether you want to lose weight, gain muscle, increase your strength, energy, endurance or flexibility, up your coordination, train for an athletic event, look great for wedding or reunion, or just stay in shape, working with a One to One Fitness trainer will help you realize your desired results. Why not give it a try? First Four Sessions on us to “Jumpstart” Your Success! New One to One Fitness members* receive a free health-risk assessment and four (4) free personal training sessions as part of our “Jumpstart” Program! We assess your health risk and fitness using our Visual Fitness Planner. You will learn about your current fitness level as well as your risk for certain diseases (including diabetes, heart disease, stroke and cancer) and how to reduce that risk. You and your personal trainer will use the assessment to identify fitness goals and develop a personalized program to achieve them. One-on-one training sessions help you get the most of your workouts. Interested? Learn more about personal training and meet our training staff. *Jumpstart program is available to first-time members of One to One Fitness. Excludes those signed up through the Graduate and Professional Student Wellness Initiative.